Now you can dream of the simple life from the comfort of a sturdy Amish bed frame. Our Amish furniture is preferable to the furniture that you would get at a traditional retailer for a variety of reasons. Amish furniture tends to last a long time. You won’t have to worry about your bed frame falling apart after a short period of use. This is because our furniture is crafted to last; the furniture that we make is built from the finest selection of North American hardwood and assembled by craftsmen with extensive experience in creating this style of furniture. If you’ve been looking to upgrade a shoddy or worn out bed frame, there is no better place to look than here at Amish Furniture Showcase. We have a selection of Amish furniture that is sure to hold up for many years to come. The last thing that you need in your life is to have to worry about replacing a crumbling bed frame, which is why our products are a great fit for people who lead busy lives and don’t want to have to replace furniture every time they turn around. Also, keep in mind that buying an Amish bed frame is a responsible thing to do because you will be contributing to a local business rather than sending your money off to a large retailer. Additionally, our products are proudly made in the USA. 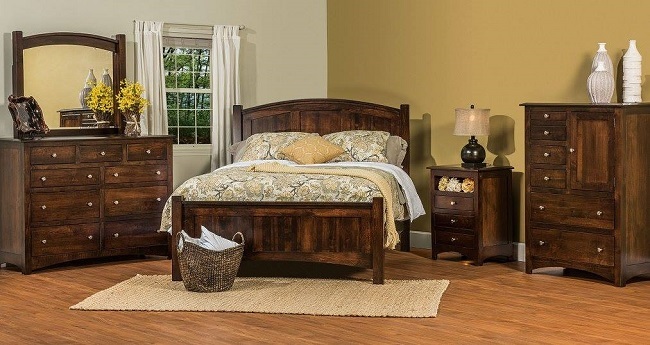 Here at Amish Furniture Showcase, we take great pride in providing quality Amish furniture. Having been in this business since 2002, we know how to provide customers with the furniture that’s right for them. Not only do we sell bed frames, but we can also provide you with a wide array of furniture, from cribs to tables. If you are in the Dallas area and have any questions about the products that we offer, please feel free to contact us.